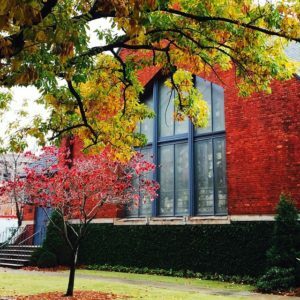 Trinity Episcopal Church has been an active community of faith in Columbus, GA since 1834. We have a vibrant congregation with a rich history. We are also excited about the growth and changes in our wonderful city, and we look forward to our future and welcoming new people into our family. We are a part of the mainline denomination, The Episcopal Church, and also the worldwide Anglican Communion. 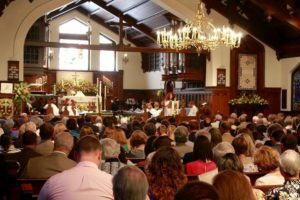 We are also a part of the Episcopal Diocese of Atlanta, a group of 104 worshipping communities in North and Middle Georgia. Our worship is reverent and formal, yet we strive to be welcoming to all. We follow an ancient pattern of worship, based on the Book of Common Prayer, and there is communion at most of our worship services. On Sundays we have two worship opportunities: 8:00 am in our chapel, and 10:30 am in our nave. We strive to put forth our best in our worship of God, through music, preaching, and the participation of every person attending. Our worship grounds us, and prepares us for a life of faithful service as Christians. 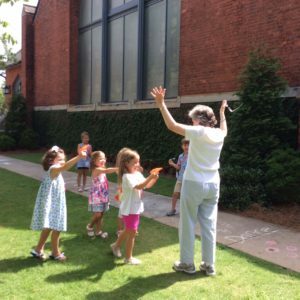 During our 10:30 am worship, younger children are escorted to a Children’s Chapel where they experience an age appropriate sermon and focus on scripture. They rejoin their families later on during the service for communion and prayers. We also have two worship services in the chapel during the week; each Wednesday at 11:30 am (Holy Eucharist Rite Two – contemporary, healing service) and Thursday at 7:30 am (Holy Eucharist Rite One – traditional) . On Wednesday we gather for Evening Prayer in the Chapel at 5:30pm, followed by supper in the parish hall. We offer many educational opportunities for adults and children of all ages. On Sunday mornings we typically have at least two different adult offerings, and classes for children and youth. On Wednesday evenings throughout the academic year we offer a parish family fellowship meal, Evening Prayer, and educational programs for children. There are also special youth activities on Sundays and Wednesday evenings, and various Bible studies for adults. Serving others in the name of Jesus Christ is important to us. Each Sunday morning we serve a free breakfast at 7:30 am for the homeless and others in need. We also have a clothing closet ministry, a prayer shawl ministry, a benevolent grant fund for non-profit organizations (the St. Francis Fund), and we participate in Habitat for Humanity, Valley Interfaith Promise (VIP) family hosting, and numerous other outreach endeavors.